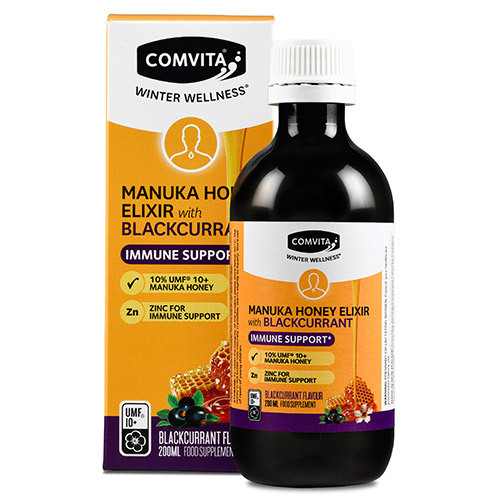 Comvita Manuka Honey & Blackcurrant Elixir Winter Wellness is an all in one formula combining UMF grade Manuka Honey with a range of botanicals and zinc. Zinc contributes to the normal function of the immune system. New Zealand UMF grade Manuka Honey is highly regarded and its reputation continues to grow. Blackcurrants contain high levels of anthocyanins. Contains 10% UMF 10+ Manuka Honey. Providing Zinc for Immune Support. Comvita Manuka Honey & Blackcurrant Elixir - 200ml. Each 10ml contains: Multiflora Honey, UMF® 10+ Manuka (Leptospermum scoparium) Honey 1.3g (10%), Blackcurrant (Ribes nigrum) juice concentrate 1.3g (providing anthocyanins 10mg), Apple (Malus spp) cider vinegar, Purified water, Elder flower (Sambucus nigra) extract equivalent to 520mg dry flower, Maltodextrin (anticaking agent), Zinc gluconate (providing 3.4mg elemental zinc, 34% RDA*), Peppermint (Mentha piperita) oil, Xanthan gum (thickener), Eucalyptus (Eucalyptus globulus) oil, Tea tree (Melaleuca alternifolia) oil, Fennel (Foeniculum vulgare) oil. Contains no artificial colourings, flavourings or preservatives. Adults: Take 10ml (2 teaspoonfuls) 2 to 4 times a day. Take up to 40ml daily. Children 2 - 8 years: Take 2.5ml (half teaspoonful) 2 to 4 times a day. Take up to 10ml daily. Children 8 years and over: Take 5ml (1 teaspoonful) 2 to 4 times a day. Take up to 20ml daily. Not to be given to children under 2 years of age. Do not exceed recommended daily intake. Shake well before use. To retain the integrity of this product please store below 30 degrees. Below are reviews of Comvita Manuka Honey & Blackcurrant Elixir - 200ml by bodykind customers. If you have tried this product we'd love to hear what you think so please leave a review. Bought for my elderly mum.. She swears by it and takes it all year round.